Consider a dynamical system consisting of three gravitationally interacting point masses, , , and . Let mass represent the Sun, mass the planet Jupiter, and mass a comet. Because the mass of a comet is very much less than that of the Sun or Jupiter, and the Sun and Jupiter are in (almost) circular orbits about their common center of mass, the dynamical system in question satisfies all of the necessary criteria to be considered an example of a restricted three-body problem. The mass of the Sun is much greater than that of Jupiter. It follows that the gravitational effect of Jupiter on the cometary orbit is negligible unless the comet makes a very close approach to Jupiter. Hence, as described in Chapter 4, before and after such an approach, the comet executes a Keplerian elliptical orbit about the Sun with fixed orbital parameters; that is, fixed major radius, eccentricity, and inclination to the ecliptic plane. However, in general, the orbital parameters before and after the close approach will not be the same as one another. Let us investigate further. because in our adopted system of units. Here, is the angle of inclination of the normal to the comet's orbital plane to that of Jupiter's orbital plane. 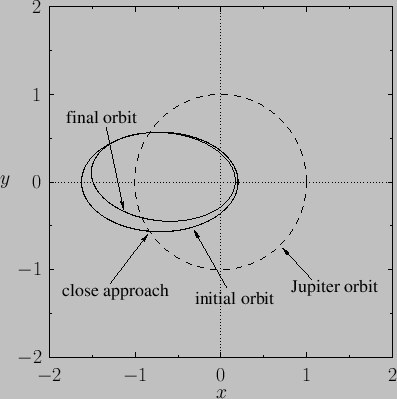 Figure: Changing orbit of a hypothetical comet with a close approach to Jupiter. The solid curve shows the cometary orbit, and the dashed curve shows the Jovian orbit. and are Cartesian coordinates in Jupiter's orbital plane. The origin is the center of mass of the Sun-Jupiter system. The system of units is such that the Jovian major radius is unity, and . Both the comet and Jupiter orbit in a counterclockwise sense. This result is known as the Tisserand criterion after its discoverer, the French astronomer Felix Tisserand (1845-1896); it restricts the possible changes in the orbital parameters of a comet due to a close encounter with Jupiter (or any other massive planet). 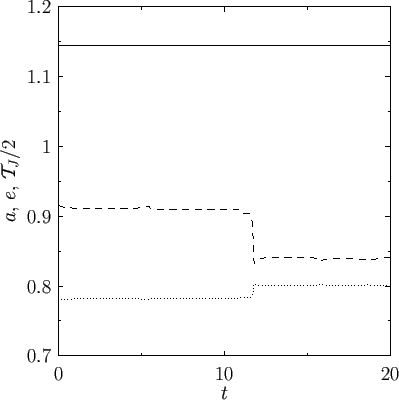 Figure: Major radius, , (dashed curve) and eccentricity, , (dotted curve) of the hypothetical comet shown in Figure 9.2, plotted as functions of time. The adopted system of units is such that the Jovian major radius and orbital period are both unity. The solid curve shows the comet's Tisserand parameter, , divided by two. If this parameter has the same value as that of a previously observed comet then it is quite likely that the new comet is, in fact, the same comet, but that its orbital parameters have changed since it was last observed, due to a close encounter with Jupiter. Incidentally, the subscript in the preceding formula is to remind us that we are dealing with the Tisserand parameter for close encounters with Jupiter. (The parameter is, thus, evaluated in a system of units in which the major radius of Jupiter's orbit is unity). Obviously, it is also possible to calculate Tisserand parameters for close encounters with other massive planets. Figure: Jovian Tisserand parameter versus major radius for all the principal asteroids (small circles) and comets (large squares) in the solar system. The dashed line indicates the Tisserand parameter of Jupiter. The dotted line shows the Jovian major radius. Raw data from JPL Small-Body Database. Figure 9.2 shows the changing orbit of a hypothetical comet that has a close approach to Jupiter. The initial orbit is such that (in units in which the major radius of the Jovian orbit is unity), , and , whereas the final orbit is such that , , and . Figure 9.3 shows the comet's major radius, , eccentricity, , and Tisserand parameter, , as functions of time, before, during, and after, the encounter with Jupiter. It can be seen that the major radius and the eccentricity are both modified by the encounter (which occurs when ), while the Tisserand parameter remains constant in time. This remains true even when the small eccentricity of the Jovian orbit is taken into account in the calculation. The Tisserand parameter is often employed to distinguish between comets and asteroids in the solar system. This idea is illustrated in Figure 9.4, which shows the Jovian Tisserand parameter, , plotted against the major radius, , of the principal asteroids and comets in the solar system. The Tisserand parameter of Jupiter (which is almost exactly three) is also shown. It can be seen that, roughly speaking, asteroids have higher Tisserand parameters than Jupiter, whereas comets have lower Tisserand parameters. The only major exception to this rule is the so-called Trojan asteroids (see Section 9.8), which all have very similar major radii to Jupiter (because, by definition, they must have the same orbital period as Jupiter), and consequently have lower Tisserand parameters (because they generally have higher eccentricities and inclinations than Jupiter). The lower Tisserand parameters of comets with respect to Jupiter, and of Jupiter with respect to regular asteroids, is indicative of the fact that comets generally originated beyond the Jovian orbit, whereas regular asteroids generally originated within the Jovian orbit. The Tisserand criterion is also applicable to so-called gravity assists, in which a spacecraft gains energy due to a close encounter with a moving planet. Such assists are often employed in missions to the outer planets to reduce the amount of fuel which the spacecraft must carry in order to reach its destination. In fact, it is clear, from Equations (9.16) and (9.19), that a spacecraft can make use of a close encounter with a moving planet to increase (or decrease) its orbital major radius , and, hence, to increase (or decrease) its total orbital energy.